​like this one. 1-4 pm, drop in for 1 hour, For ages 6-100, taking 16 people. $25/person. Register now, pay at the door. 717-419-9566. Stop in by appointment with ideas for pet, people, wedding couples, home/business buildings, vehicle/boat, college campus landscapes, and other projects. In watercolor, acrylic, ink, pencil/graphite, colored pencil, charcoal/white pencil, digital art, mixed media. 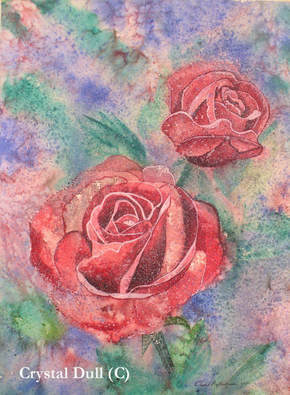 Drawing mediums with optional painting (watercolor/acrylic on canvas). taking 8 kids 8:45-11:45 am and 8 teens 1:15-4:15 pm per camp. Register with $40 toward $140/5 days or get on waiting list for $35/per day for 1-4 days. PHOTO Portrait SESSIONS BOOK by appt. day/evenings at 717-419-9566 text or call. $40 SPECIAL FOR 2 PEOPLE on Sat. April 13, 9 am - 6 pm. BOOK by appt. day/evenings at 717-419-9566 text or call. $60 for 30 minutes. Includes all high quality photos on disk or bring a USB flash drive. 1 hour is still $120. Optional $15/photo print sheets available in various size prints. 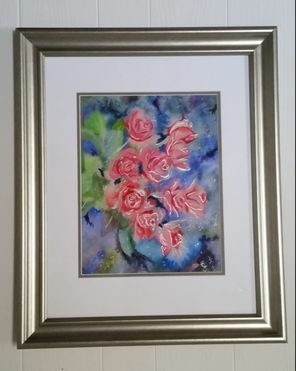 FINE ART on SALE - sale ends 5/1/19 Check out the Rain Roses below. ​GIFT CERTIFICATES - in any amount. Purchase by phone and we mail it. Or buy at our shop. GIVE some ROSES that will not die. 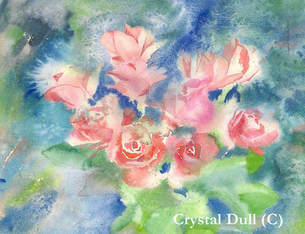 ​11"x14" "Rain Roses Bunch" - Limited editon watercolor giclee' print. $63 in frame, $58 in mat only. 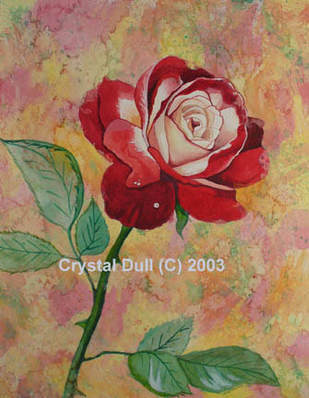 Close up of "Rain Roses Bunch"
​giclee' print with silver accents painted on it. ​ Pick up in Lititz, PA. Shipping $ not included. ​ I take Credit/Debit on the phone or pay at shop cash, check credit, debit. 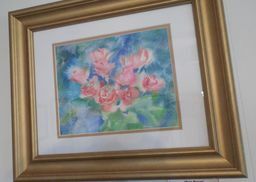 $135 in frame with cream mat. $78 in white mat only. Pick up in Lititz, PA. Shipping $ not included.